Having outgrown its previous premises, DDZ Technologies last year moved to a new facility in order to provide the necessary equipment, storage and office space to meet its growing workload, and to furthermore establish some headroom for future growth. 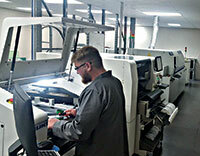 Having a bigger space is all well and good, but to expand its manufacturing capacity, more equipment had to be acquired. In late 2016, the company purchased a brand new Autotronik machine with three placement heads, capable of placing up to 12 000 components per hour, in addition to a second-hand Microflex stencil printing machine, to join its existing Fritch pick-and-place machine, SEF reflow oven and wave soldering machine. To accommodate the new equipment and make the SMT production area more clinical, the complete area was rebuilt before the new equipment arrived. DDZ also acquired an offline desktop inspection machine, enabling all of its boards to be automatically inspected. The end result of all this is a maximum placement capacity of five million components per month, giving the company access to jobs that it wouldn’t have been capable of before. This is aided by a huge variety and quantity of feeders, as well as the new Juki machine’s high-tech vision system consisting of a normal resolution as well as high resolution camera, allowing placement of almost any component with great accuracy. A matrix tray server allows 20 trays of the same or different components to be made available. It has become common practice to use blind, filled and stacked vias in many portable electronics products. Experience has shown that this method of interconnection is reliable, provided the fabrication process is well defined and controlled. Taking advantage of modern TCP/IP communication and XML data format technologies, Hermes is effectively a replacement of the more than 20-year-old SMEMA standard. 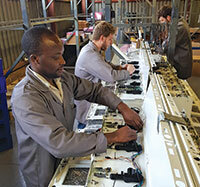 We asked representatives from two leading South African contract electronics manufacturers to share some of their insights into this complex landscape. BGA failures occur for component, printed board, process or design related reasons, and on some occasions, both X-ray and optical inspection cannot easily provide the answer.